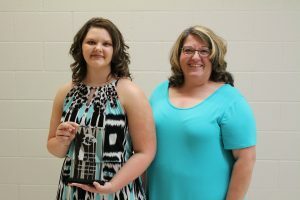 From left: CHS CTE Student of the Quarter Kimberly Lemasters and Business Management and Administration Support teacher Rhonda Williams. Cameron High School senior Kimberly Lemasters has been named Career & Technical Education Student of the Quarter in the Business Management and Administration Support program. Kimberly is the FBLA President, FCCLA Treasurer and Student Council Vice President. She is also a member of the Governor’s Program, Rachel’s Challenge, SADD Club, Blood Drive Club and Art Club. Kimberly is the daughter of William and Teresa Lemasters of Glen Easton. She will attend Pittsburgh Technical College to study Hospitality and Tourism. Her goal is to eventually work for Disney.